We always enjoy wordless books in our class. Such a fantastic opportunity to build oral language skills, share creative ideas, practice inferring from pictures and celebrate the power of a great illustrator. 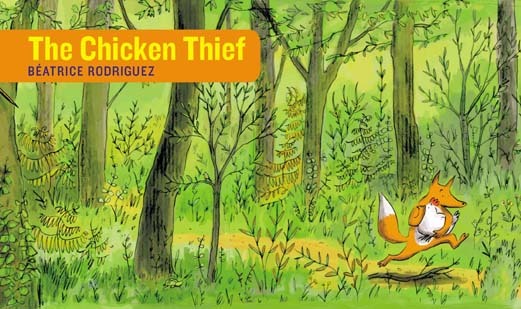 This past week we fell in love with the talented Beatrice Rodriguez and her delightful books featuring a fox, a hen, a rejected rooster and some would be rescuers. It starts off with a dramatic kidnapping. Fox steals a hen and her friends race off in pursuit. 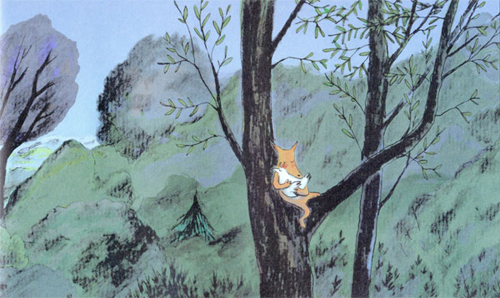 Bear, Rabbit and Rooster are determined rescuers and Fox ends up deep in the forest, sleeping up in a tree for the night to stay ahead of the animals. He keeps Hen snuggled close. Row Row Row your Bear, Off to catch the thief! We caught him! What a relief! Finally, we reached the shore! Finally, we got back to the story. Bear, Rabbit and Rooster do eventually make it to Fox’s home and here they find Hen and Fox sipping tea by the fire. In a wonderfully peculiar twist, Hen leaps up and declares her adoration for Fox and the other animals seem to accept the news and leave Fox and Chicken to a life together. Although Rooster doesn’t look very pleased . 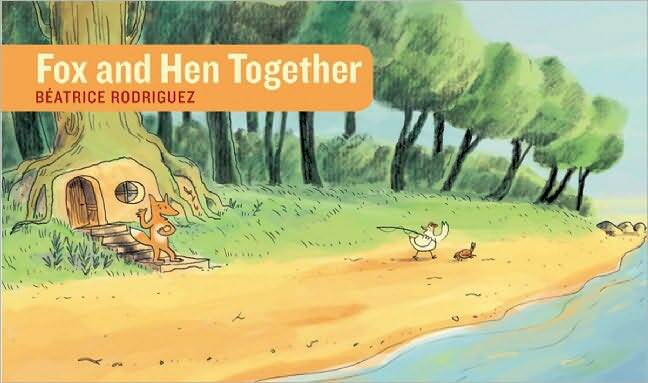 . .
We then read Fox and Hen Together which continues the story of our two curious lovebirds. 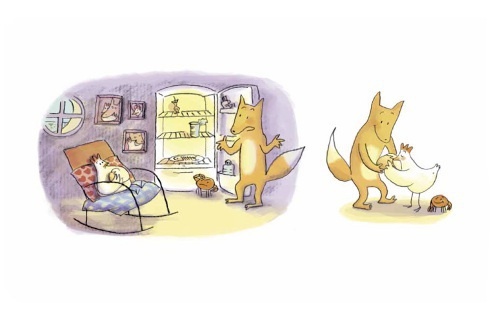 The story begins with Hen snuggling an egg that seems to be hers while Fox stands at the refrigerator in dismay. The fridge is empty. What to do? Hen takes charge passing the egg delicately to Fox and she and Crab ( a new friend it seems) head out to solve the problem of nothing to eat with determined steps and a fishing pole. As one might imagine, there is nothing typical about this fishing expedition. At one point a huge eagle snatches up the fish that Hen and Crab have caught and the two of them end up in the eagle’s nest sharing space with ravenous eaglets. Yikes! They next encounter a ferocious sea serpent and narrowly manage escape thanks to some very creative fishing line tricks and twists by Hen. When Hen and Crab race safely to shore they find a frying pan and a cracked shell on the table. Hen initially suspects the worse of her mate but is overwhlemed with joy when she realizes that her baby has hatched! Fox, Hen and Crab celebrate the birth with a toast of something bubbly and a fish roast of epic proportions (sea serpent anyone?) Students spent quite a while trying to decide what kind of creature the baby might be. A Ficken? Foxen? Chickox? Endless possibilities! Luckily all of us “squawked” loudly and in such praise of these two books that our wonderful Teacher Librarian Ms. Sheperd-Dynes purchased these titles for our library and also picked up Rooster’s Revenge, the book that rounds out this imaginative trilogy. Of course we shared it in class the very next day! We found this title to be much darker but in a wonderully fantastical way. We first pored over the cover noticing Rooster’s body language and expression. He looked jealous, angry, overwhelmed and dejected (this was my word, helping us stretch vocabulary) This book picks up from when Rooster, Bear and Rabbit row away in the boat, leaving Fox and Hen to themselves. They hit a storm and are washed ashore onto an island, landing on huge boulders. 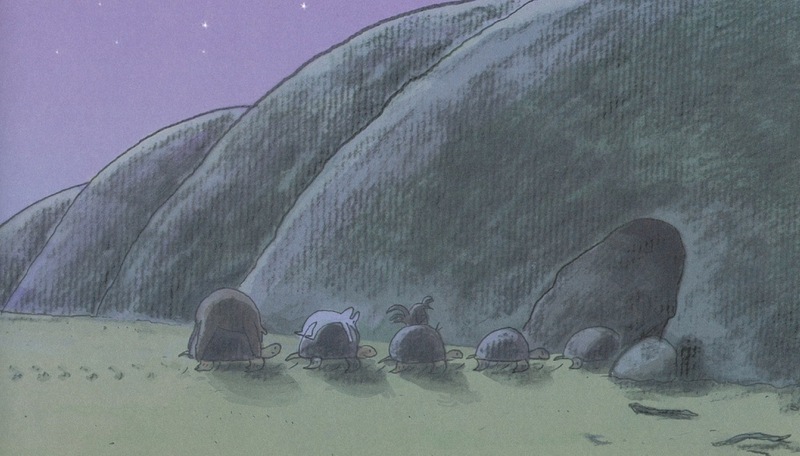 As we looked at the full page spread though, we realized those rocks were not really rocks but instead turtles! Turtles that escorted our shipwrecked characters into a cave. Inside the cave, Rooster spots a glowing something. Is it a stone? An egg? Clearly he is mesmerized. He snatches it in his wings and races away from his friends with an eerily evil expression on his face. “I think that’s a bad idea,” Khai warns as we turn the page. The next few pages have Rooster, Bear and Rabbit traveling through a strange landscape. Huge mushrooms. Glowing lizards. And then it is back out onto the open sea. (We began trying out a rhyme that began Row Row Row your Mushroom but found ourselves too caught up in the story). When Rooster reaches land, his stolen egg hatches. Our seemingly possessed Rooster is quickly charmed by this little baby dragon and he shows him off proudly to the hens back home. So it seems that this little quirky clan of animals will now be down a hen but up a dragon and all will live happily ever after. Until the next adventure? I love these books for a variety of reasons. They are quirky. They are incredibly engaging. They provoke laughter, deep thinking questions and endless discussion. And. . . . the song inspiration was pretty incredible. “And you are going to like these books Ms. Gelson because they have a strange shape,” Catriona reminded me. Very true. I do have a penchant for rectangular books. 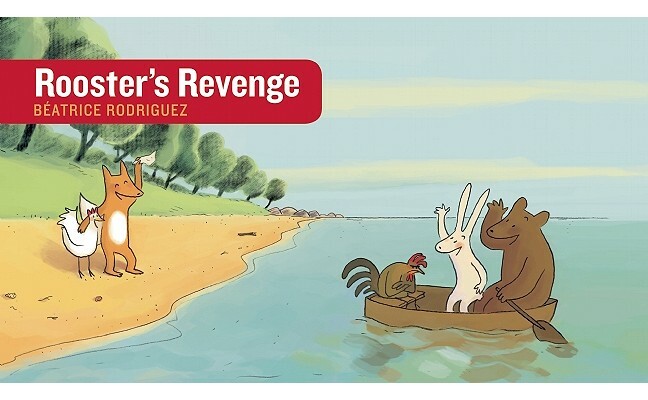 We were so intrigued by this trilogy by Rodriguez that there were many mutterings of hope for Book #4. Amazing reviews of these books can be found on these blogs: 32 pages and books4yourkids.com. Love wordless books? You might also enjoy: Using Wordless Books in the Classroom, Wonders of Wordless Magic and Few Words on Five Wordless Books. This entry was posted in Picture Book Love and tagged Beatrice Rodriguez, fantasy, favourite illustrators, fiction, great read alouds, library books, wordless by carriegelson. Bookmark the permalink.